In the early days of space exploration, NASA basically made up procedure on the fly. With little knowledge of the world outside our atmosphere, agency physicians worried what humans might encounter out there. Maybe John Glenn would go Space Blind. Maybe the Apollo 11 crew would track an Andromeda Strain through the Lunar Command Module, unleashing a deadly moon virus on a defenseless earth. Better safe than sorry, NASA figured. Here's how scientists attempted to protect our planet—and the rest of the solar system—from the threat of extraterrestrial microbes. First of all, NASA always took planetary protection very seriously. The Office of Planetary Protection (OPR) was formed in 1967, as part of the United Nations Treaty on Principles Governing the Activities of States in the Exploration and Use of Outer Space, Including the Moon and Other Bodies. This treaty states that party countries "shall pursue studies of outer space, including the moon and other celestial bodies, and conduct exploration of them so as to avoid their harmful contamination." Essentially, the treaty demands that countries take all steps necessary to defend our biosphere from space germs, and vice versa. The idea was to prevent a real life Blob snafu on Earth, while simultaneously stopping the spread of Streptococcus bacteria throughout the solar system. The existence of life on the moon or planets cannot . . . rationally be precluded. At the very least, present evidence is not inconsistent with its presence. . . . Negative data will not prove that extraterrestrial life does not exist; they will merely mean that it has not been found. To contain any alien life forms, astronauts, spacecraft, and lunar materials coming back from the moon should be placed immediately in an isolation unit; the astronauts should be held in rigid quarantine for at least three weeks; and preliminary examination of the samples should be conducted behind absolute biological barriers, under rigid bacterial and chemical isolation. The various government agencies figured that, based on their knowledge of terrestrial bacteria and virii at the time, that any sort of infectious super-bug would more than likely reveal itself within 21 days of infection. Thus, their solution for crew memebers was simple—three weeks of quarantine supplemented with daily intensive medical exams. (Like, "turn your head and cough," times one-thousand). 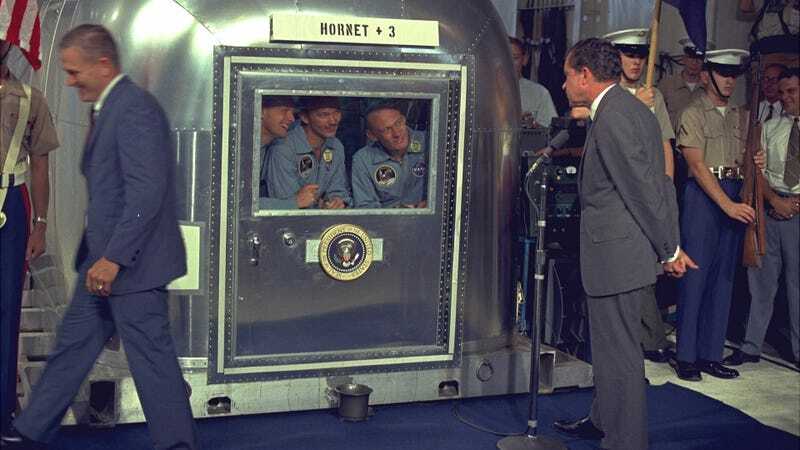 To handle returning spacecraft, sample containers, and transport vehicles, NASA built the most advanced bio-containment structures of their day—the Mobile Quarantine Facility (MQF) aboard the USS Hornet and the Lunar Receiving Laboratory (LRL) at the Johnson Space Center. When the Apollo 11 crew splashed down in the Pacific, they first donned Biological Isolation Garments (BIG suits) provided by UDT decontamination specialist, LT Clancy Hatleberg, from the Hornet's retrieval team. Made from a special nylon-based material that isolated microorganisms from the body, these bio-iso suits used high-efficiency respirators to keep the astronauts breathing while the crew was airlifted from the command module to the MQF. Before leaving the command module, everyone aboard was wiped down with sodium-hypochlorite (think super-bleach) while the command module hatch got a once-over with betadine to sterilize any moon dust that might have hitched a ride. Upon being interred at the MQF, the BIG suits, the UDT decontamination equipment, even the raft that the Apollo crew stood upon was cleaned and sunk. Helicopter 66, the one that ferried the crew to the Hornet, was locked away in quarantine while lunar samples and film canisters were immediately shipped to Houston. The MQF was a purpose-built module, shown above, created to transport the Apollo 11 crew from the middle of the Pacific to the LRL in Houston, TX without ever exposing anyone to Earth's atmosphere. Roomy enough to house six astronauts, it included a lounge, galley, sleeping and head facilities, and was powered externally by the Hornet. Strong negative internal pressure and state-of-the-art air filtration helped to maintain quarantine during transport. All waste water and biological effluence was first chemically treated, and then stored in sealed quarantine buckets. All meals within the MQF were designed to be microwaved within their in sterile sheaths. Once the Hornet reached Houston, NASA transferred Apollo's crew and equipment to the 83,000 sqft LRL where they would spend the next 21 days. This isolation facility housed the crew and all support staff that had come into contact with them, including two crew surgeons, a recovery engineer, medical laboratory technicians, cooks, and stewards. Meanwhile, on-site testing facilities determined if lunar samples were infectious. As at the MQF, all liquid and biological waste was chemically treated and stored, while all expunged air was incinerated before being released into the atmosphere. The primary biological barrier consisted of the vacuum complex and Class III biological cabinets. A secondary barrier was maintained in the Crew Reception Area and the sample laboratory by keeping the areas at negative pressure with respect to the atmospheric pressure external to the building. Within these two barriers, the postmission work on returned lunar samples was performed. Crew members' time there involved a litany of medical exams—daily pulse and oral temperature tests, interviews with the crew surgeon, biological samples collected on the 12th and 18th day of quarantine, and a full physical on the 21st. Since quarantine measures had to be maintained in any event, had any astronauts come down with space plague, they'd have been treated within the LRL. It was stocked with the latest in emergency medical equipment, and it even had a small pharmacy. Thankfully, the outbreak never happened. The current procedures and methods, as dictated by the "Outer Space" Treaty of 1967, are developed by the Committee on Space Research (COSPAR), which is part of the UN's International Council of Science (ICSU). They vary depending on the type of mission being undertaken—planetary flybys, orbital missions around the moon, and landing on passing asteroids all carry distinct potential biological threats. Therefore, all proposed space missions are now rated on a five-category scale according to their catastrophic potential. Any mission to the Sun, Mercury, or other celestial body with virtually zero chance of biological contamination and for which NASA has no interest in studying possible biological systems. Any mission to Earth's Moon, Venus, comets, Jupiter, Pluto/Charon, Kuiper Belt Objects or other bodies wherein NASA wants to perform "simple documentation" of biological and chemical systems but where the chance of contamination remains remote. Any flyby or orbital mission for the specific purpose of studying chemical or biological systems of bodies suspected of harboring life. This includes trips to Mars, Europa, Titan, or Enceladus where forward-contamination (Earth microbes invading other planets, moons, etc) may occur. Any mission that involves landing on extraterrestrial bodies for the specific purpose of interacting or otherwise probing for chemical processes and would present a significant-enough chance for forward-contamination to threaten the biological sanctity of the area studied. For example, the latest Mars Rover mission is considered a Class IV given the slight, albeit very real, chance of accidentally introducing staph or another common Earth bug into Martian soil via its various probings. The same goes for upcoming missions to Europa, Titan, and Enceladus. Any mission that sets down on a foreign body and subsequently returns to Earth carrying samples is automatically deemed a Class V, given the opportunity for back-contamination of Andromeda Strain proportions. This class is divided into two subcategories: Unrestricted and Restricted. Unrestricted Return to Earth is employed when the extraterrestrial body isn't considered a possible host for life and is about Class III stringent. Restricted Return to Earth missions however are tighter than a Green Zone checkpoint. This mission designation means that NASA will gladly throw a multi-billion dollar spacecraft into the Sun rather than let it reenter orbit if containment protocols have somehow been breached. Even if containment is maintained, the OPR dictates that "Post-mission, there is a need to conduct timely analyses of the returned unsterilized samples, under strict containment, and using the most sensitive techniques. If any sign of the existence of a non-terrestrial replicating organism is found, the returned sample must remain contained unless treated by an effective sterilization procedure." "When we do bring samples back to Earth, we can't do what we did with the moon rocks. The folks back then simply didn't handle samples in a way that's consistent with our understanding today of what we need to do. We have to think about how we will collect samples of Martian soil and bring them back in a container that has never contacted the Martian atmosphere. We'll need a set of diagnostic tools onboard so the spacecraft can do contamination testing. Then we can decide whether we want to divert the spacecraft somewhere or send it into the sun, depending on the level of risk." While the prospect of dying via space plague is a terrifying thought for humans, we have a much greater chance of decimating indigenous extraterrestrial species before we even know they exist. Just as European explorers obliterated Native American populations with imports of smallpox, scarlet fever, and influenza, our spacecraft teem with bacteria, despite being shot through the vast radioactive voids of space. We know this because of the unmanned moon exploration vehicle Surveyor 3. Despite being constructed in a Class 100,000 clean room, a small population of Streptococcus bacteria lived onboard Surveyor 3. The microbes not only made it to the Moon but survived for three years on the lunar surface. Subsequent studies have shown that multicellular animals like tardigrades couldn't give two shits about having to live in a lack of atmosphere. Furthermore, DNA contamination can last even longer than bacteria in the icy embrace of space. So how does NASA prevent its unmanned spacecraft from acting like modern day John Rolfes? Sterilization, and lots of it. Until NASA finishes perfecting decontamination via hydrogen peroxide vapor, it relies on a combination of clean rooms, gamma radiation, ultra-violet radiation and heat to nix terrestrial microbes before we shoot our scientific loads into space. The most effective method is known as "Viking-level sterilization procedures" in reference to the Viking lander missions to Mars. The Viking Lander was constructed in a class 100,000 clean room—meaning that fewer than 100,000 particles sized 0.5 microns or larger were present per cubic meter of air. All components of the lander were also baked at 115 degrees Celsius for over 50 hours before being packed for launch. However, since many modern components can't handle that extreme temperature, low-heat hydrogen peroxide vapor techniques are being developed. This involves subjecting the component to multiple cycles of a vacuum which has been flooded with Hydrogen Peroxide gas. Looking forward, Class 100,000 won't cut it anymore. In fact, it's barely better than a normal room. Spacecraft under construction now are built in Class 100 clean rooms. These push hyper-scrubbed air in one direction through a room to minimize particulate contamination. The rooms themselves are protected from infection by atmospheric barriers. Looking back, one day, these methods may seem as primitive as the practices used 45 years ago on the Hornet. It would be truly awesome to encounter life elsewhere in the universe. But such an occasion does not come without risks.